Q. (1-5) Study the table carefully and answer the following questions. if the population in village P and R are in ratio of 2: 1 then, what is the ratio of inoperative Bank Account in Bank P and R.
If out of the total inoperative Bank account in village Q half account holder is female which is equal to 300, then find the total population of village Q? If the population of village R and S are in ratio of 1 : 2, then number of people in village R having Bank account is by what approximately percent less or more than that of village S? if the ratio of population in village P, Q and R are in 1: 2: 3 then what percent of people in village P, Q and R taking together have a bank account? The number of student A who passed only in Subject Qis what percentage of the number of student B who passed either only in Subject R or only in Subject P? The number of student B who passed in Subject P and Subject Qbut failed in Subject R is what percentage of the number of student B who passed in Subject Qand Subject R but failed in Subject P? what is the total number of student A who passed exactly in two subjects? How many student B are there who passed exactly in one subject? 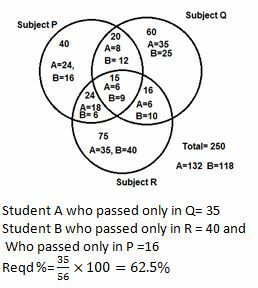 What is the ratio of the number of student A to the number of student B who passed in Subject Qand Subject Rbut failed in Subject P?